Two Layer is Upgraded Version of Monolayer, Where its has Two Extruders and from Which Layer is made and Process it’s the same . However two layer gives an Advantage of Manufacturing of Two Color Sheet like Mulch Film which is used in Agriculture Sector. A Mulch Film has inner layer Black and outer Layer Silver in which granules are mixed with UV Chemical in order to provide strength against Sun rays. Here the formation is of HDPE (HM) LDPE /LLDPE. Now Coming to Another Two Extruder Blown Film Process is ABA. Now here the Extruders are two but formation of the Film is Three Layer, Extruder A shares the Inner and Outer Layer and B is Middle Layer the Concept is to Manufacture Three Layer Film with Less Investment on the Machine and Good Quality. Now Lets Understand the Technology for the Machine Two Layer could be Provided with Rotating Die or Could be Provided with a Reversing Haul Off Unit. The Concept is Provide the Film With any Gauge Variations. 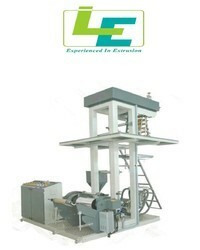 This Machine could also be Provided with Single Winder, Back to Back Winders or Even without Winder. Manufacturer of Tarpaulin of LDPE, Mulch Film, Blown Stretch Film, Shrink Film etc are Sectors wherein Two Layer Blown film Machine are used . But Tarpaulin Manufacturer doesn’t need Rotating Die or Reversing Haul Off unit and also for these customers we understand the Granules are used is 100 % Re-Process so we certainly ensure that Machine is Designed according to the Final Application. 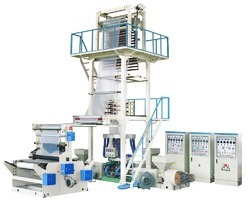 Now Lets Understand ABA Blown Film Plant, First thing is that this Machine cannot manufacture two Color film as Inner and Outer Layer is Shared by Extruder A, But the Concept is Manufacture Three Layer Film. Many Manufacture Uses Re-Process Granules About 80 % in Extruder B and Extruder A have Complete Virgin Materials so the Final Application has Good Shining on the Sheet Because both Inner and Outer Layer is of Virgin Granules. It is Important that there are Many Dairy Products has to be Packed in Three Layer Film as Well Water Packets so this Really Helps Manufacturer to get the Film from ABA in which way the Manufacturing Cost is Lower Comparatively to Three Layer Blown Film Plant. We are a trustworthy organisation in offering a wide gamut ofBlown Film Extrusion Lines. We are a trustworthy organisation in offering a wide gamut ofFilm Blowing Machine. We are a trustworthy organisation in offering a wide gamut of HM Blown Film Machine. We are a trustworthy organisation in offering a wide gamut of LDPE Film Machine. We are a trustworthy organisation in offering a wide gamut of Multilayer Film Machine.